Description: A look at the approximate proportions of the features of the face and head. For small children, the big difference lies in the location of the eyes. For children, the eyes are found below the “half-way” mark between the top of the head and the bottom of the chin. The relationships between the other features of the face stay about the same, but because the eyes are so much lower, it means that the distance is much shorter between them (eyes to nose, nose to mouth). Hi Matt, looking forward to progressing with this great course, my goal over the next 12 months is to focus on portraits and figures in various mediums, I will let you know how I get on. I have just completed in oil Edgar Degas two dancers entering the stage and the most challenging aspect was getting the faces to resemble the original, but the satisfaction on completing the the painting was enormous, I have gained so much confidence through your courses. The video appears to be working normally. You may try scrolling over the video and selecting the “HD” icon to turn high definition streaming off. It will make the video load much faster. HI there, where is the photo reference for this module please? There is no photo reference for this module. The portrait was drawn purely from imagination. This depends on the overall value of the subject. If the subject is very light, then a dark background is best. If the the subject is dark, then a lighter background makes more sense. Have you tried refreshing your page and playing the video again? When we draw that circle and the inside square, do we need to use different faces as different referance? or just draw the same circle for different face ? 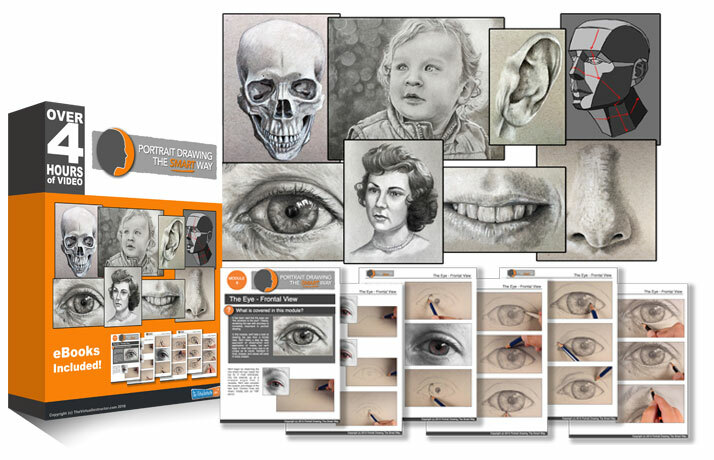 This module covers the basic proportions. These may vary slightly depending on your subject. It is a good place to start, but you may find that you need to make adjustments as the drawing develops. Thank you Matt, I am learning so much. I have searched and searched for online classes and you and your site are the absolute best!